Hello again...finally. I hate that I haven't been able to write. I got too busy, which was not what I was aiming for when I moved here to Winston Salem! It just seemed everything happened at once...I had two Kaplan classes to teach with a an updated curriculum I had to learn, I started working with hospice and had to go out of town for computer training for three days, and I had some hours at Whole Foods. Just too much. I decided something had to give and that was Whole Foods. My hours there were very sporadic. Last weekend no hours and next weekend 8 hours both days after full weeks of hospice the week before and after. 12 days of work in a row is not in my plan so I gave my notice and this past weekend was my last shift. I feel a little guilty for not staying long, but relieved that my weekends are all my own again. Now I can work in my yard, visit my mom, play with my friend Caryn and the triplets....all sorts of fun things. I am still thinking through work and seeing what might come my way. The hospice job is only part time as needed and right now they are generous with hours as I am orienting. Long term, I am not sure the hours, and I don't get benefits, so I am keeping all my options open. I keep reminding myself my word for the year is OPEN. So we'll just see what happens. So today I don't have a recipe, just lots of pictures. I am always a proponent of getting out of the house and being active. A couple of weeks ago, I took time to go on a garden tour here in Winston. It was 9 gardens at homes throughout the city. It was raining and gray but I got out anyway, although I only went to 5 houses. I really enjoyed it and was happy to be outside. It also inspired me to get out in my yard and get things cleaned up and planted. Here are some photos so you can share it with me! This first house was incredible. I walk by it often and was thrilled to see it up close. It is owned by an orthopedic surgeon and is huge. Doesn't everyone need a conservatory and a croquet lawn? They had flower arrangements set out around the yard that were some of the prettiest I have ever seen. 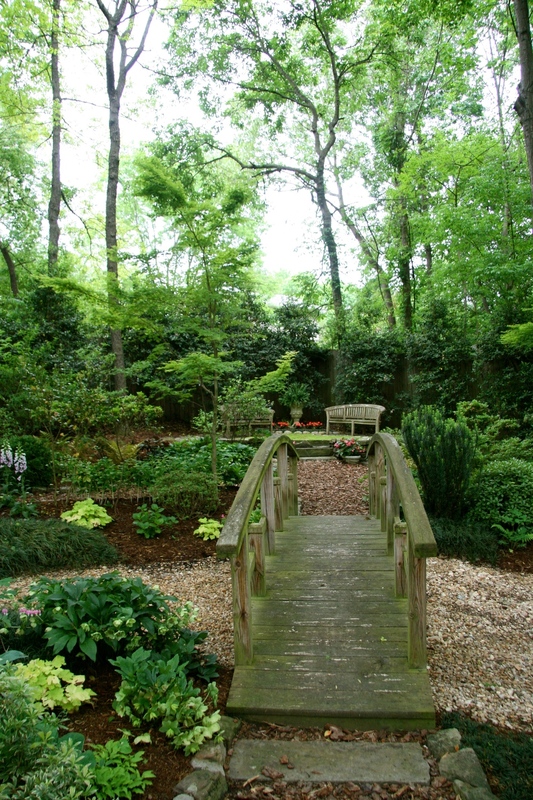 This second one had a large wooded section to their yard that was filled with all kinds of hostas and other shade loving plants. As my dad liked to say, it was a "park-like setting!" The house above is one I walk by all the time and love the house itself with it's green tiled roof. 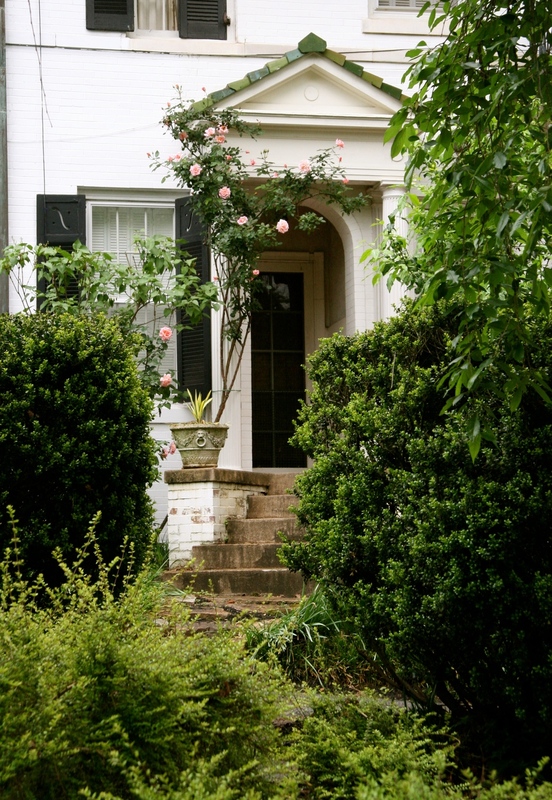 It is an old, beautiful home and has a nice pool surrounded by roses. Their sweet dog was the designated greeter! I think garden tours are a great outing. Seems like most towns have one, and you get a chance to see great houses and great flowers. A beautiful peony in my yard...one I planted from bare root in the Fall and it worked! So that's it for today. Sorry for the short post and the long absence. I hope to cook a little more and post three or so times per week. We'll see how it goes. This week is not so busy....yoga outside at one of the parks downtown tomorrow night, and then Thursday evening there is a discussion at a local Irish pub with the priest from my church and a local Rabbi.....they are talking religion and politics. They have a discussion once a month but break for the summer so this is my last chance to get there. Otherwise, some work with hospice and some time in my yard and I am a happy camper! The boys checking out the bouquet I made from my yard for my Mom on Mother's Day....kitty approved!